ATV’s approach using the Cold Wall Process Chamber is also applied in the SRO-706 Getter system. This system can be applied for Thermal as well for Electrical Getter processes in R&D and Production line applications. 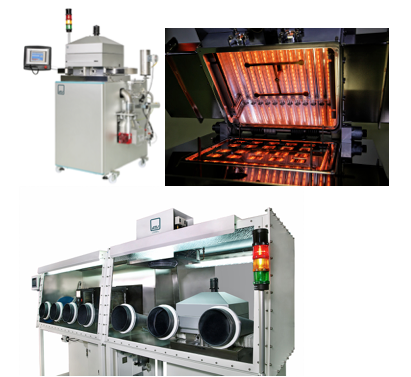 The basis for the Getter system is the successful SRO-706 series IR vacuum reflow oven. Common applications are sealing of packages with Kovar caps or optical windows for gyroscopes, microbolometer and various MEMS sensors under high vacuum by applying thermal and/or electrical GETTER activation. integrated into a glove box system including several baking ovens. When using the glove box option ATV can warrant that the process can be performed in a dry and oxygen free atmosphere. The SRO-706 Getter is a result of in-depth cooperation with our customer base and listing to the needs of the market as you may expect form ATV. team are dedicated to help our users getting the best return from investment of the ATV equipment.